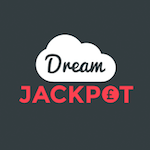 Every Friday Dream Jackpot casino puts an exciting match bonus at your disposal. Existing British players that deposit £20 minimum on Friday, will receive a reload bonus of 25% up to £50. This is valid only for table games. Cash out only after you’ve wagered the bonus funds and the deposited amount 35 times. Claim your bonus and have a jolly evening playing some cool games.